Just this last week, on March 24th, Van Halen “5150” turned 30 years old. This was the first album released after David Lee Roth left the band and the first of many to feature Sammy Hagar on lead vocals. I wasted no time buying this album on cassette the day it came out. And as the above and below photos show, I still own this cassette. 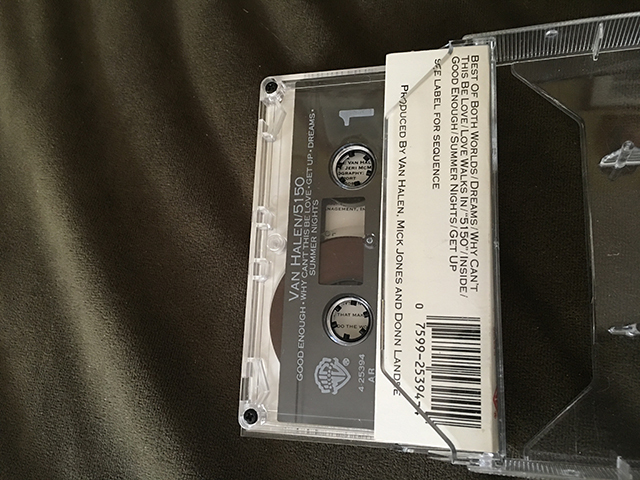 The actual cassette inside it’s case. I didn’t purchase my first CD until 1988, so all of my music was purchased on cassette or vinyl. Since cassettes were easier to carry and I could instantly play them in my Sony Walkman, I normally purchased them over LPs in the mid-80’s. I embraced the album right away, giving this cassette hundreds of listens over the years. Up until this last week, it had been a good 18 months or so since the last time I listened to the album from start to finish. So that’s what I did on Thursday and most of this weekend, albeit in digital format on my iPhone and iPod. The future of the band was in limbo after DLR left the band. I’m sure there were a few lead singers suggested, but the story seems to be pretty consistent that Sammy was one that always got a mention, even if Eddie Van Halen appeared to be clueless when he first came upon the idea that Sammy would round out this rock quartet quite well. Most of us that grew up in the 70’s, knew who Sammy Hagar was already. He was the voice of Montrose, the star of his own solo career with many hit singles and albums [who doesn’t have “I Can’t Drive 55” in their head now?] before he landed the gig in Van Halen. I was a fan of Van Halen since their first album, so “5150” was like starting over, with the familiar guitar, bass, drums and harmony backing vocals still intact. It didn’t take long to see that Van Hagar was going to be huge. While not as best selling as the debut album and “1984”, which both are at Diamond, “5150” eventually went on to sell 6 million albums, making it one of the most successful rock releases in a long time. Of particular note, this was Sammy’s first number 1 album up to that point in his career. Of the 9 tracks on this album, I always liked the first 8 very much. The last song on the album “Inside” was one I always skipped. It was easy to skip since it was the last song and even if I let it play because I didn’t want to have to fast forward on the cassette all the time, I rarely was a fan of that song. Just didn’t grab me. The other 8, however, were stellar songs and ones that got ingrained in my head forever. To this day, when I play the album from start to (mostly) finish, I know what song comes next, I know the lyrics, I know the jams, drum hits and every detail that I remember hearing so many times over and over. If you are a fan of this album, tell me about your experience with this album below in the comments. 30 years is a long time for any album release and Van Halen’s “5150” is no different. And I think that will be the same when it turns 40 in 2026. Maybe my cassette will still be around by then. 5150 will always have a special place in my heart as it was my first Van Halen album. Sure Jump was a hit in the UK (got to number 7 in the chart), but Why Can’t This Be Love entered the charts just as I got into my 7″ single habit and I was hooked. Played that record to death and ended up also getting 5150 on cassette. It wasn’t until later, in my former life, that my ex-wife played all the DLR era stuff (she couldn’t stand Sammy and was a huge Dave fan) and I got to know and love the early VH. But for me 5150 and OU812 will always be special and the VH that I grew up with. This is so good to read that you are a fan of this album. For the first 2 Sammy Van Halen albums to be a huge part of your life is great to read. I was a latecomer to VH with my first album being OU812 (to this day it’s my favorite). But seeing as how I started with Van Hagar, I stuck with it and always preferred the originality of the band with Sammy over the constant use of cover songs with DLR. 5150 was a great album and I will always love it. 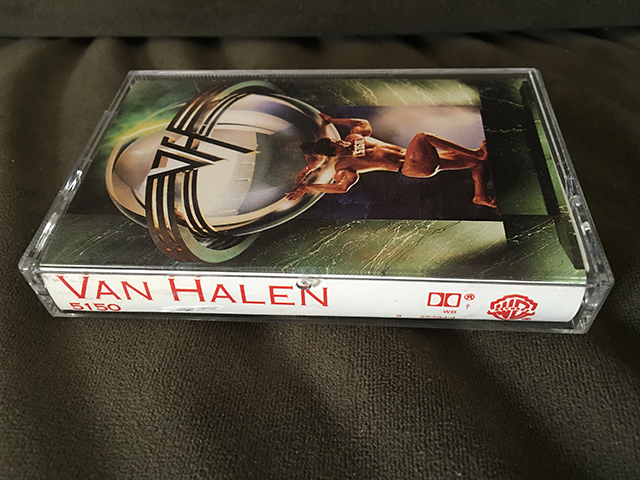 I do believe it is also my wife’s favorite VH album. I know of your love for the OU812 album as you’ve not only tweeted about it but I believe you’ve blogged about it as well. Cool to hear that 5150 is your wife’s favorite. I hope your cassette is still around then! I think it’s awesome you have it! I need to listen to the whole album – I don’t think I’ve heard it all! Yep. Still have the cassette. Those pics above were taken just minutes before I blogged this post. If you like any Sammy era Van Halen, then I think you will like 5150.